Much as I enjoy the capability of modern mountain bikes, sometimes it’s good to take it back to the roots. If you rode a bicycle on dirt 30 years ago, you would almost certainly have been astride a steel frame with rigid forks, and providing you picked your battles, you would probably be having fun. 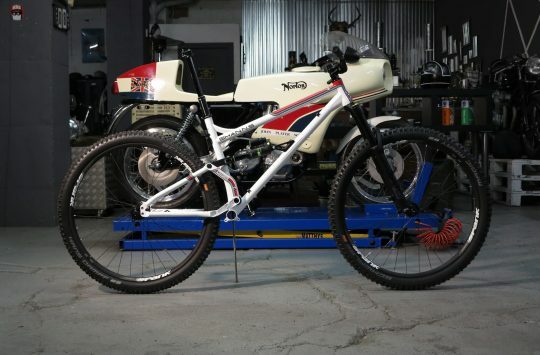 Times have changed, but those early mountain bike designers were definitely onto something. 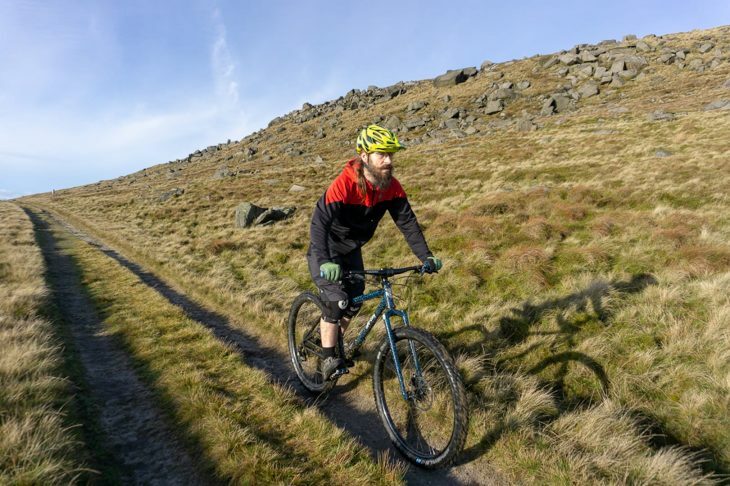 From the rolling hills of southern England to the new generation of purpose-built flow trails, there are a lot of places where a rigid bike feels right at home. 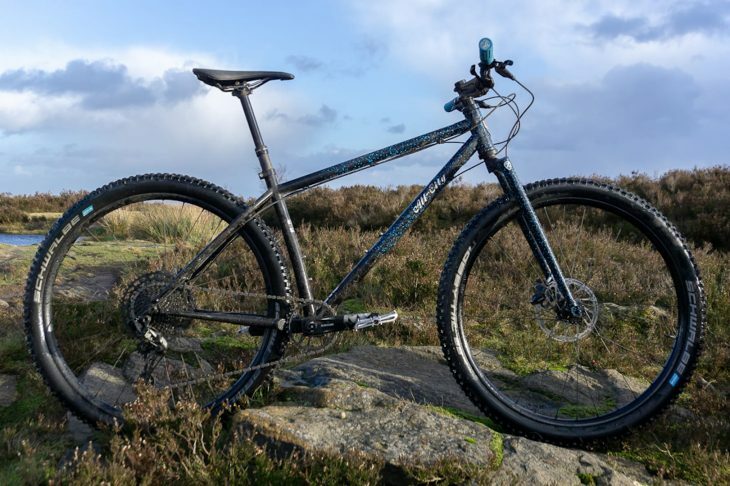 They’re lighter than a hardtail of equivalent spec, they teach you to pick good lines, and when you do manage to clean something mildly technical on one, it’s quite a buzz. So there’s still a place in my affections for a slender frame unencumbered by telescopic twonkery. The All City Electric Queen is an attempt to bring those retro bikes into the 21st century, with suspension corrected geometry, ample tyre clearance and much more. In the US, it’s offered as a complete bike, equipped with RockShox Reba forks, but UK distributor Ison is only bringing in the rigid frameset. Did I want to test one? Hmmmmmmaybe. 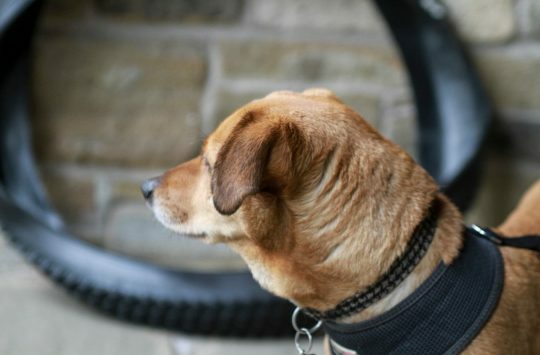 When I clapped eyes on the built-up bike, though, any misgivings over the future integrity of my wrists were set aside. Just the paint finish on the frame is enough to make you want one. 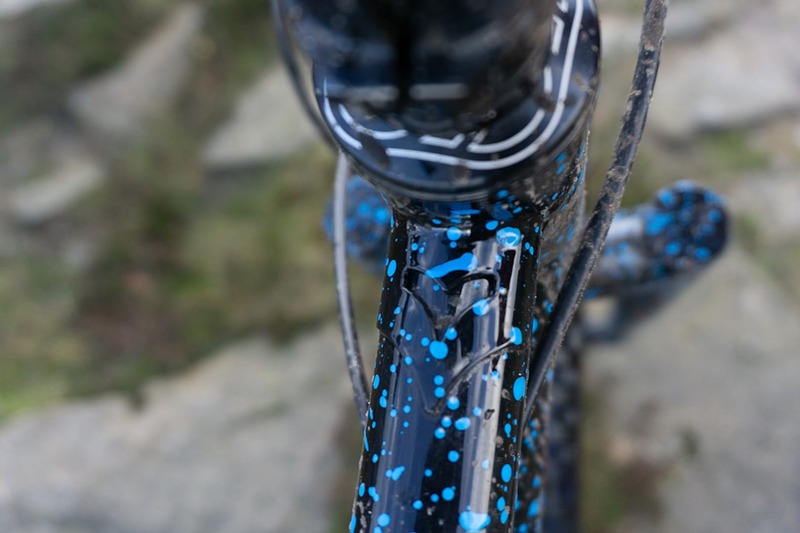 The blue splatter is applied in glorious thick blobs that stand off the black base coat, making you want to touch it. It’s retro (I immediately thought of my 1990s GT Timberline) but fresh enough to look modern. 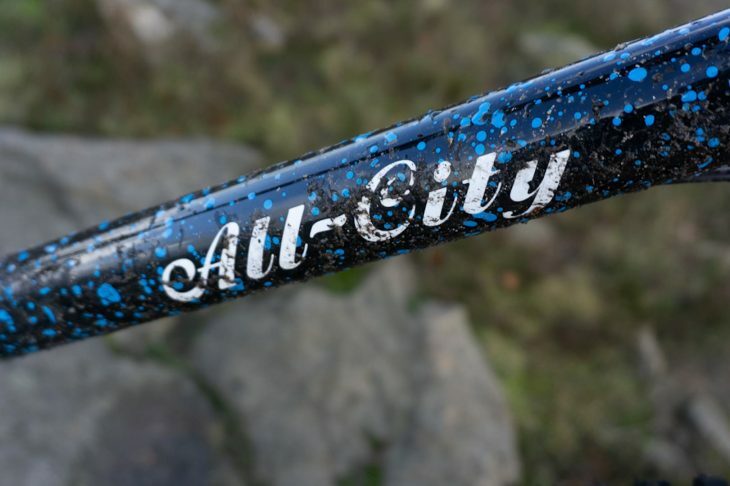 Handily for a bike test in the depths of UK winter, it’s also the type of paint job that looks great when it’s muddy. Tubing is a mix of double-butted chromoly and is internally ED coated, which should help avoid the bike maintenance moment every steel frame owner dreads, when you try and remove the seatpost only to realise it’s stuck fast. The fork dropouts and head tube brace sport custom lugwork, and there’s a brushed alloy headbadge, giving the Queen an extra touch of class. All City Cycles is part of the same parent company as Salsa and Surly, and you can see some healthy cross-pollination between the brands. The curved seatstay bridge will be familiar to anyone who’s ogled a Krampus, while the 15mm through axles even sport Salsa branding. However the Electric Queen is definitely coming from a slightly different place to its sister brands. 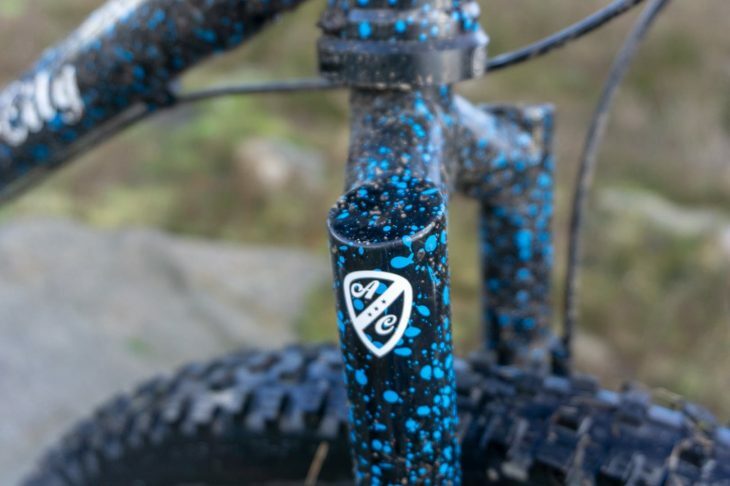 While you could use this bike for dirt touring, there are no rack or luggage cage mounts, and for everyday rides, or rough-and-ready bikepacking trips, I’d prefer a slightly more functional paint finish, meaning one that wouldn’t make me cry when I scratched it. The All City borrows from other brands in the QBP stable. 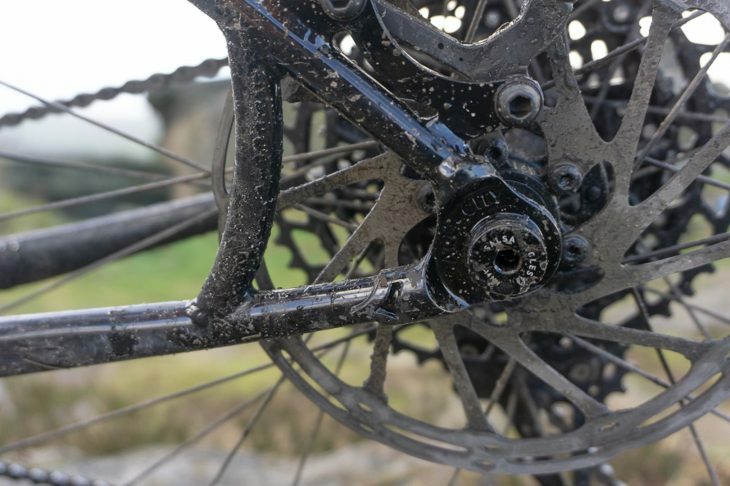 On that note, the paint on our test bike did have a minor blemish on one chainstay, which is possibly why it was released to our tender ministrations. After a few weeks I also noticed the chainstays were starting to scuff up a bit from heel rub. If it was my frame I’d be tempted to slap some helicopter tape on it, although shrouding it in plastic would also feel a bit wrong – like putting a Perspex lid on your antique desk. Whose pipes are these tubes? Under the paint job, the Electric Queen is no anachronism. 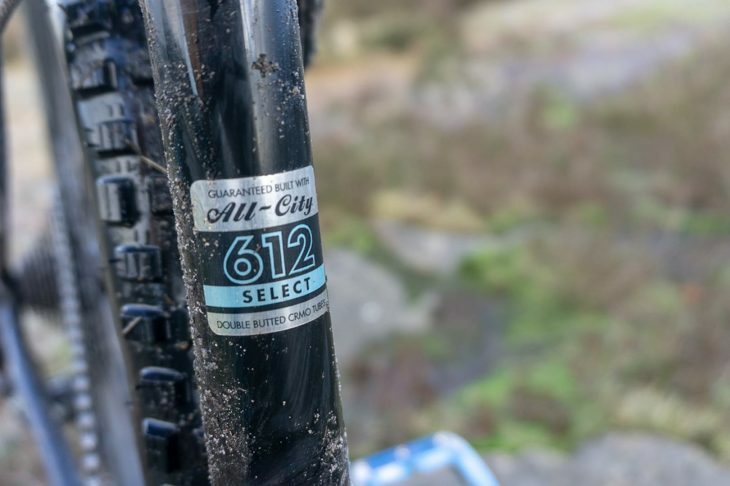 It’s designed around a modern, if not cutting-edge set of numbers, including a relatively roomy top tube, a relaxed 67.7° head angle and a 51mm offset fork. The frame and forks have Boost spacing, the back wheel is tucked in close to the seat tube for livelier handling, and there’s ample tyre clearance in 29er mode, thanks to a fancy chainstay brace. Officially the largest 29er tyre that fits is 2.25in but it’ll take a 2.5in easily, as long as you’re not ploughing through pebbly mud. The bike is also designed to be run with 27.5+ wheels shod with up to 3.0in tyres, and comes in this guise as a complete bike. 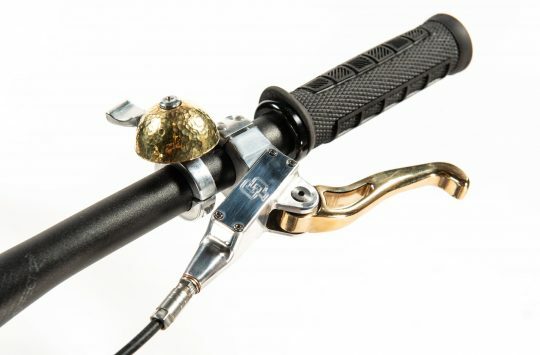 It has stealth dropper post routing. While you could potentially run a front mech, there are no cable guides or stops for doing this. 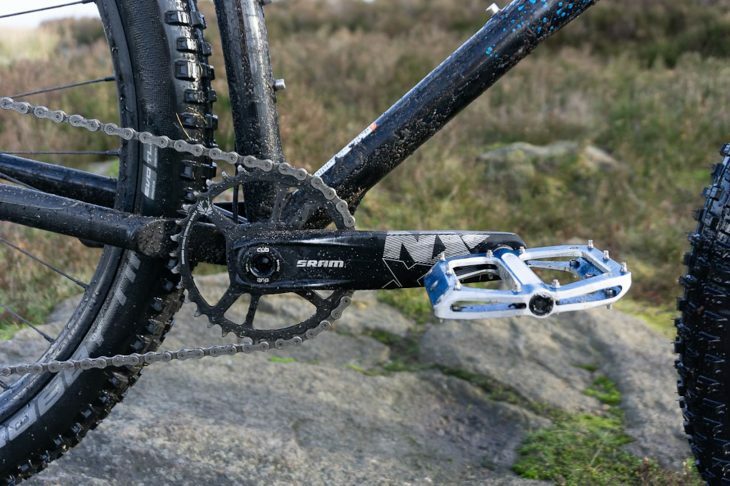 This is a thoroughly modern mountain bike. No suspension, but lovely splatter. The forks are a thing of loveliness, combining five-part segmented construction with fairly girthy blades, topped off with some subtle lugwork near the 15mm dropouts. Despite the bike’s tapered headtube, the forks have a 1⅛in steerer, which makes for a rather functional appearance as the diameter steps down. This concession aside, it’s a very pretty frame indeed. There’s some very subtle tube manipulation going on (notably the chainstays), but it’s not incongruous enough to spoil its classic look. Our test bike was built up for us with a 12-speed SRAM NX Eagle groupset, SRAM brakes and a selection of Ison’s house components, including Halo wheels and finishing kit from the delightfully-named brand Gusset. 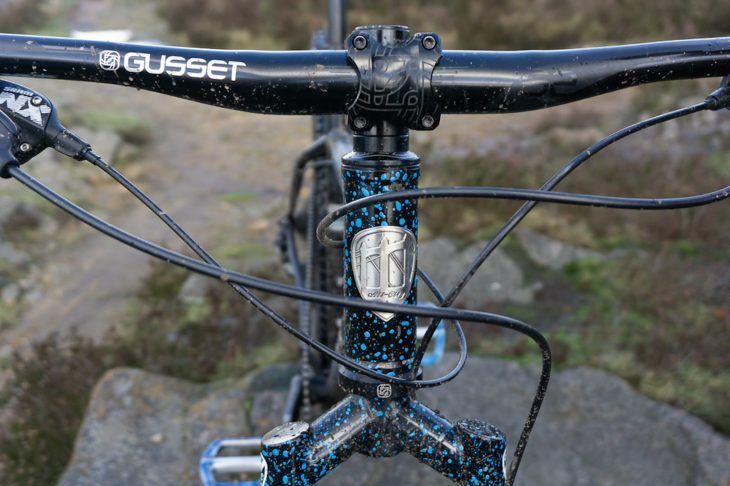 The massive 800mm bars, 50mm stem and rigid forks combined to give the Queen a big BMX feel, while an internally routed KS dropper post indicated that this bike might be something of a dark horse on the downhills. This bike deserves to see sunlight as well as slop. You Love His Photos, Now Help Colin's Life. Is that a wizard riding the bike in the pics?